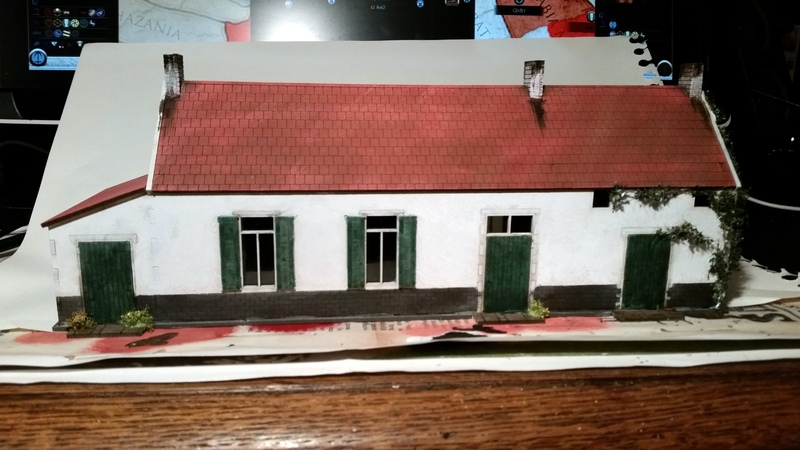 It was only a matter of minutes before I caved in and put the 28mm mdf version of one of the most famous buildings in history on my Warlord Games wishlist; and my girlfriend duly responded by putting it in my Christmas stocking. I’ve painted it up within less than 24 hours of receiving it, which must be a first for me! A great building by Sarissa Precision. This is the first mdf kit I’ve assembled, and overall I’m really pleased with this kit. It was easy to put together with just PVA, and the instruction leaf is well-made. Tip of the hat to you, Sarissa! I’ve gone through the trouble of adding glass to the windows, made from blister packs. I’ve used basecoat sprays, of course. 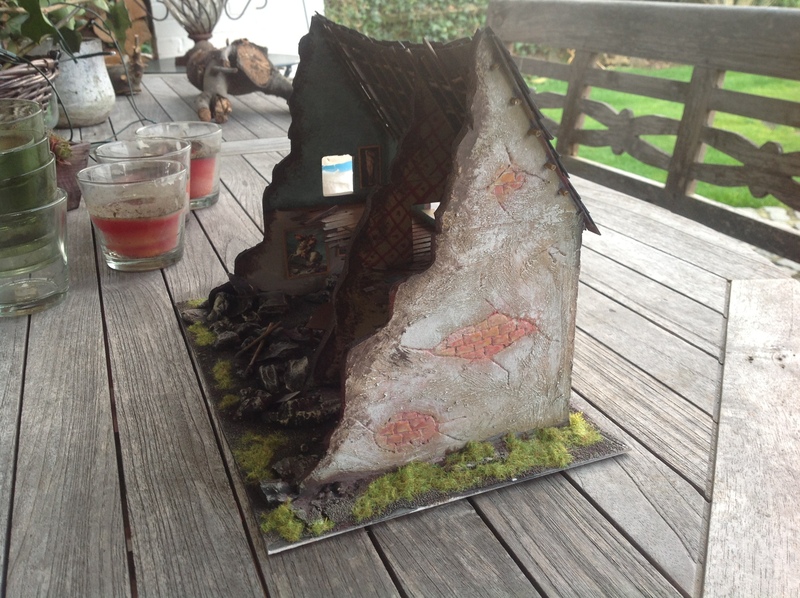 I sprayed the roof separately with mournfang brown, the main structure was undercoated with a light coat of white. Several tufts of MiniNatur flowers were added to the porches to liven the building up. The roof was fairly hard to get right; I used successive drybrushes of mephiston red, squig orange and dwarf flesh to end up at this point. It might still be a bit too dark, but I’m satisfied with the way it looks. Stock mdf buildings can often be a bit bare-looking, which is why I added some tufts and, most noticeably, some poison ivy to the one blind wall. Overall I’m very happy with how it came out. I’ll be sure to take some pictures of my French with this as a backdrop soon! 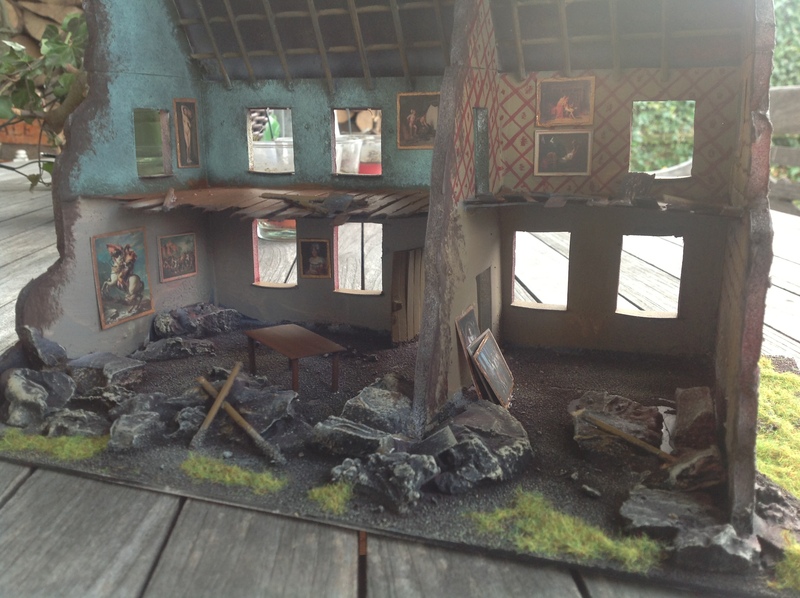 With Bolt Action having taken off in my local gaming group in Halle, we figured we’d need some scenery to fight over. 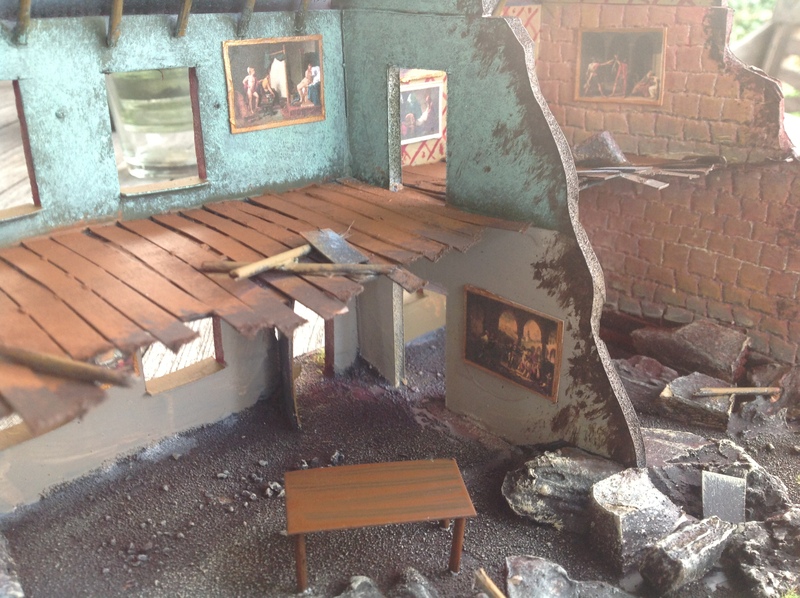 Some ruins of buildings are often the most evocative kind of scenery you can imagine, and so I sat down last week and built one. 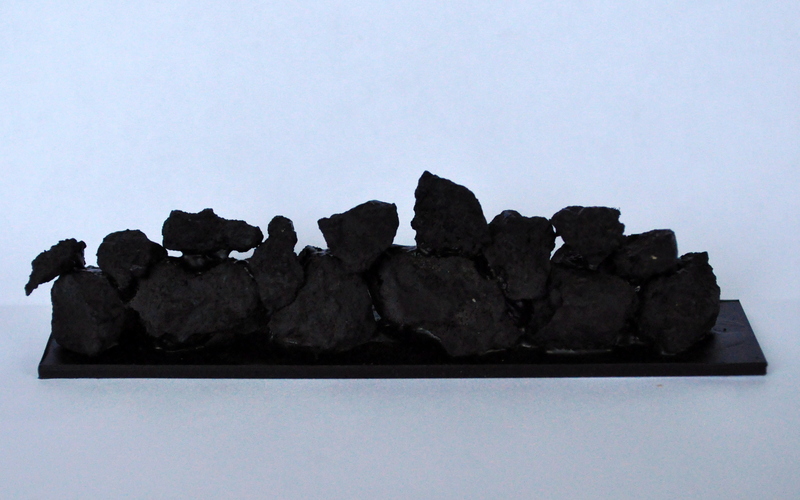 Not just any ruin though – I really wanted to go to town (pun unintended) on a challenging piece. Here then, dear readers, I present you the fruit of my labour. The front of the house, with the gallery’s sign bearing my girlfriend’s name – she’s an art historian! The walls were built out of foamcore – the stuff that architects use to create their mock-ups. 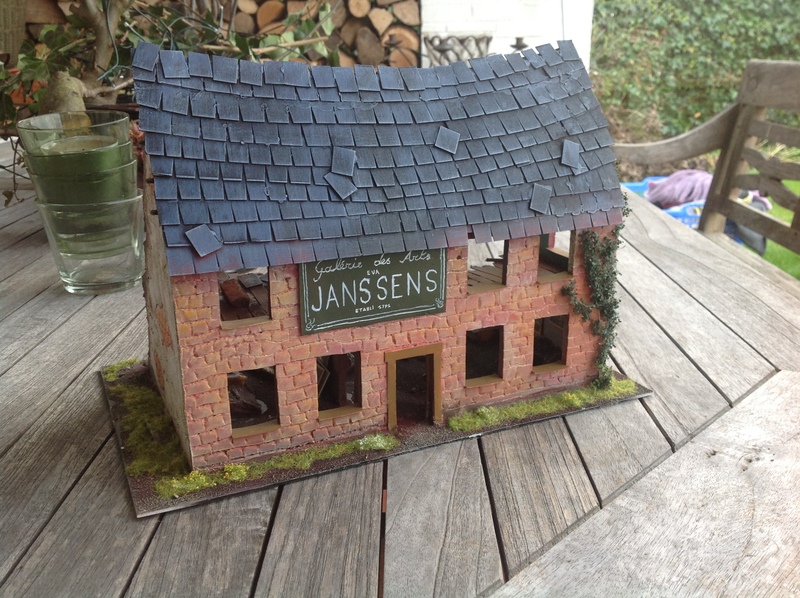 I found it relatively cheaply at a local scale modeling store, and it’s really the best material to make decent buildings out of. That brick texture was made by pressing a ballpoint pen into the thin card layer, which is simple but also immensely tedious work. The creeper plant on this corner is poison ivy by Mininature. 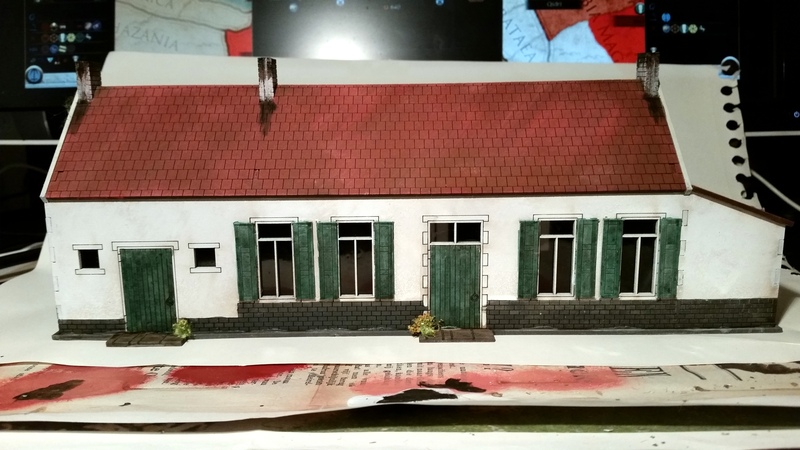 Doors and windows were cut out with an x-acto knife, taking measurements roughly in keeping with the size of the models and their bases. Once all the basic shapes were done, I glued them onto a plasticard base with a liberal application of PVA. I decided I’d done enough bricks, so I cut some corners on this wall. The floor, doors, window panes, roof tiles etc. were all made from cardboard, kindly donated by some of my Warlord boxes! Other materials used were bits of plaster that were left over from another scenery project, barbecue sticks (don’t know how they’re called in English) and good old styrofoam. Plenty of forward-looking windows, but a terrible lack of cover from the back. Of course, with it being an art gallery, the interior is the focal point of this building. 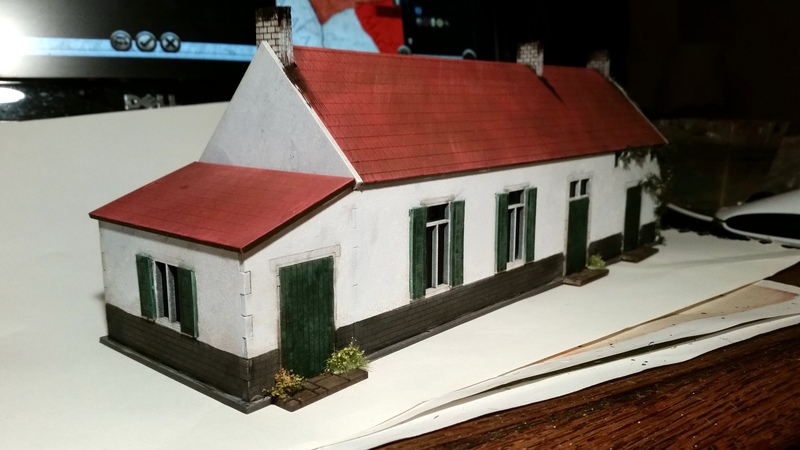 I had my girlfriend pick some paintings that are no older than the Napoleonic age – as I’d like to be able to use it for that era of wargaming as well – then downsized them and printed them out. Then they were stuck onto thin cardboard, provided with a gold trim aka poor man’s frame, and stuck onto the walls. The table is a simple piece of cardboard provided with four lengths of barbecue stick. One thing I am going to add before calling it completely finished is to add a makeshift ladder so that the top floor can actually be reached. Other than that, it’s on to another piece of scenery! 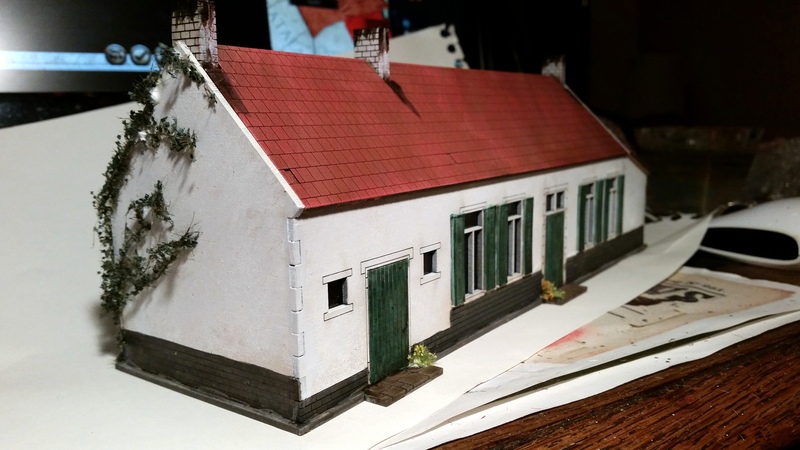 Scenery building is often low on the agenda of many a wargamer, playing second fiddle to the act of getting enough models painted. 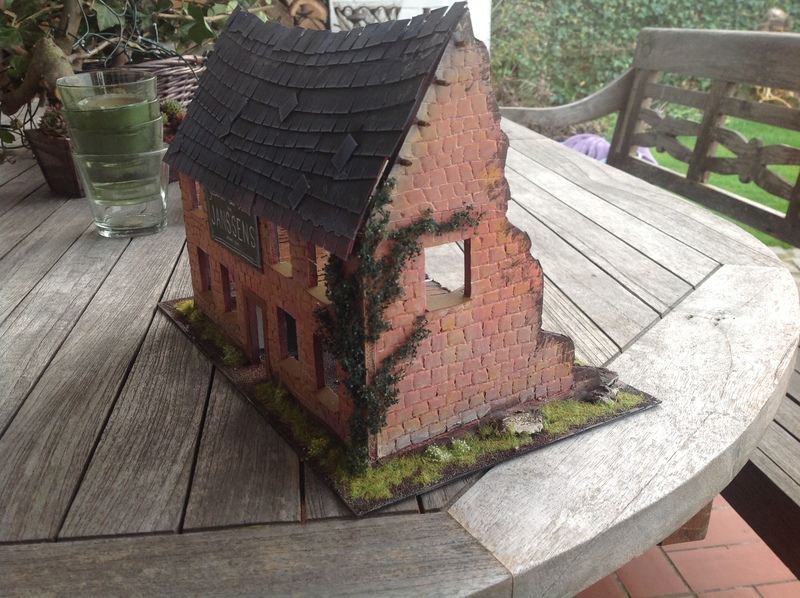 However, a lovely tabletop to play on is every wargamer’s dream – a dream I have been neglecting until recently. With my local game store closing it doors in a few weeks, I’ve started building some scenery pieces for my own collection so my friends can come round to my place instead. This article deals with a very simple project I’ve recently completed, and I hope you’ll find it helpful. 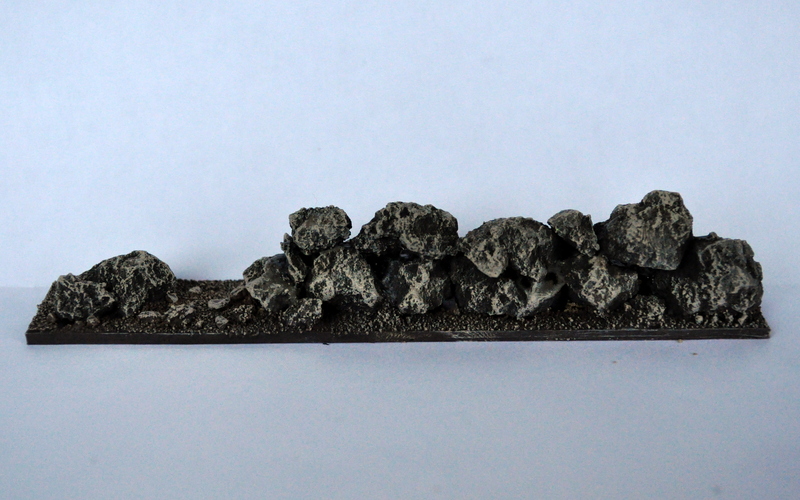 Take a base and squeeze a thick ‘sausage’ of PVA glue across the entire length of it. Then lay down the first layer of rocks one after the other. 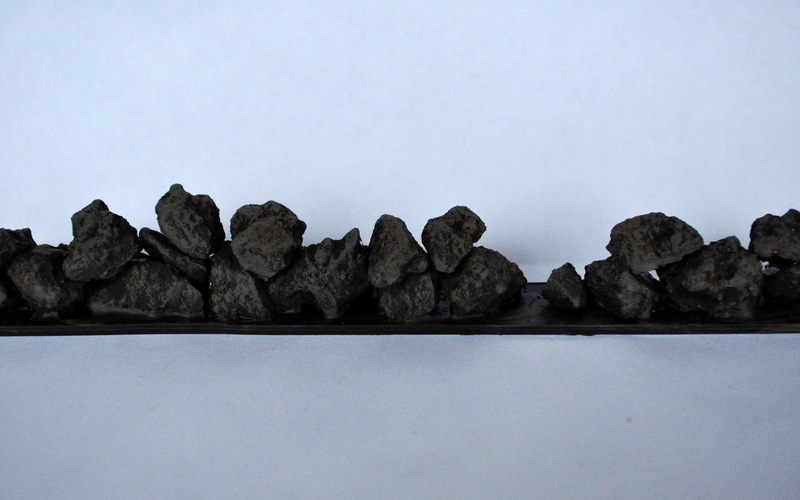 It looks better if you use the thicker rocks for this layer, and your wall will be sturdier as a result. Let this first layer dry, then add a second layer on top of it in the same fashion, making sure that the rocks from the second layer have a decent contact area with those underneath. 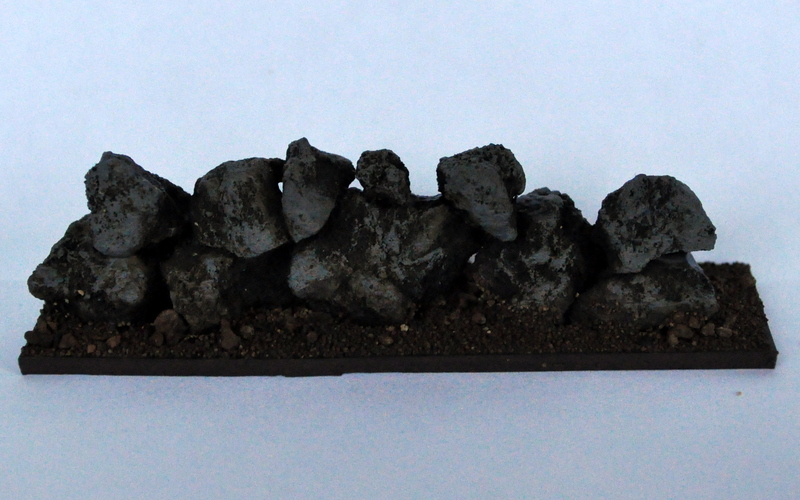 Continuing adding layers until the wall is as high as you’d like it to be – though with the size of rocks I listed you need just two to reach a nice height for 28mm models to crouch behind. Once all glue has dried completely, undercoat the walls. I used a black undercoat spray for this, but you can do this step with a brush as well. Use as big a brush as you can for this step. Choose the colours you’d like to have your walls in; they don’t have to be grey, you can do some sandstone walls, some chalky white ones etc., it really depends upon the theme you would like to have your tabletop display. For my own walls I used a drybrush of xv-88 followed by dawnstone, both applied rather heavily. Now cover the base of your walls in some PVA and dunk it in coarse sand. 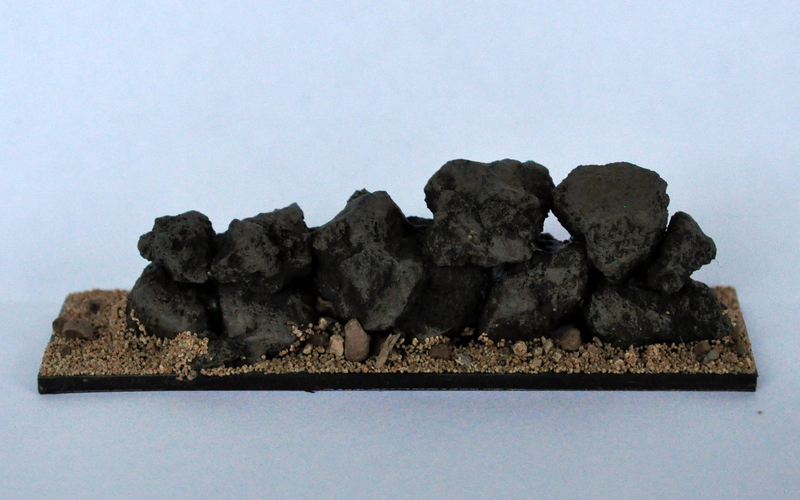 Don’t worry if by accident you get some sand onto the walls, they’ll only look a bit more weathered if you do. Using a dark brown paint and a measure of water, basecoat the sand once it’s dry. Again, don’t worry if you get some dark brown onto the walls, as it will look like a splash of mud. Once everything is dry, give both the walls and the base a final drybrush in a very light colour. I used a bone colour for this. 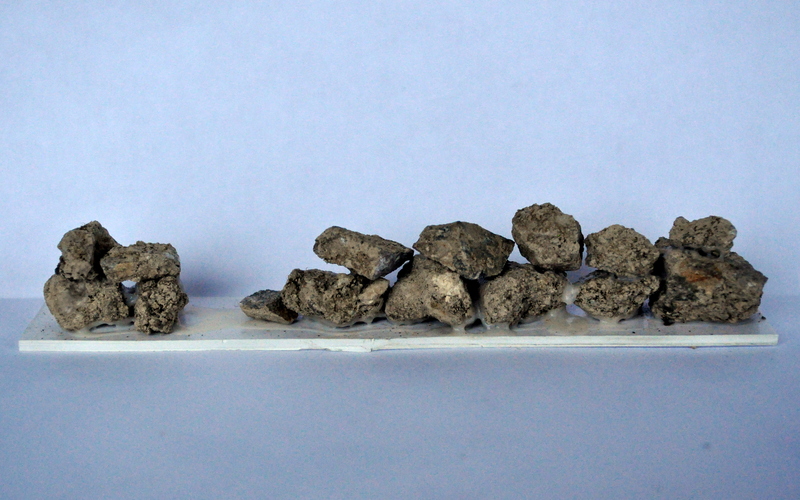 Make sure the paint on your brush is very dry, and it will pick out all the rough texture on those rocks. Afterwards, add static grass, tufts, meadow flowers, lichen etc. to your walls. You can take this as far as you’d like – you could add some weeds growing between rocks, some rock moss on top, even some bird droppings. 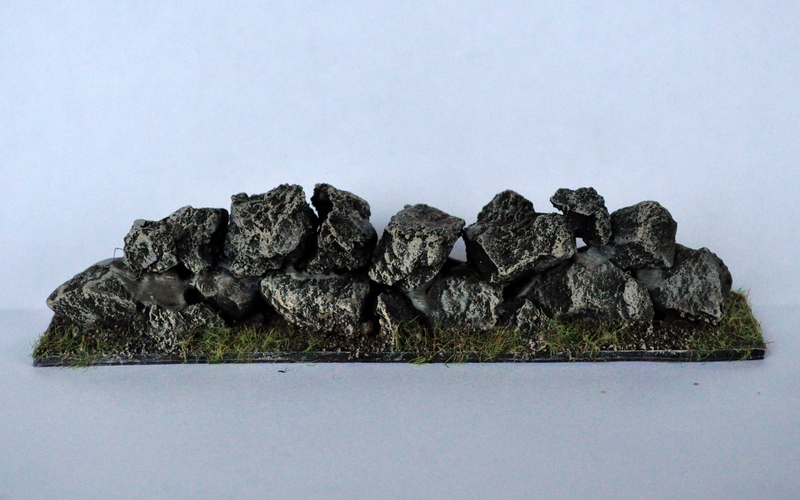 I chose to leave it at static grass to tie the bases into my standard grass gaming mat. There you go, some walls. Of course, they’re never going to be considered marvels of architecture, but this makes them fit with many periods of history, from Celtic settlements to rural farmsteads in occupied France. This project also costs next to nothing and it won’t take too much of your time. Good luck with it if you try your hand at this project!